The blockchained epoch has just begun and like any other technology, blockchain will also hit a couple of roadblocks especially in the domains where complexity conduct is very high. The true essence of blockchain lies in the fact that the power has to be taken away from centralized hands. This is achieved by decentralizing information and handing it over to the people (in the network). This is democracy in its true sense. India, being the world’s largest democracy is gracefully welcoming blockchain. National Institute of Transforming India (NITI) Aayog is presently working on national analytics data platform named ‘IndiaChain’ (India specific blockchain infrastructure) to boost the economy. IndiaChain is envisaged to leverage the power of JAM (JanDhanYojana, Aadhaar, Mobile Trinity), and other schemes of Government of India that stand to benefit from the utilization of blockchain technology. IndiaChain intends to reduce frauds, speed up enforcement of contracts, increase transparency of transactions, and boost the agriculture economy of the country. IndiaChain will be linked to IndiaStack, other government digital identification databases, and the government’s digital locker project. IndiaStack, a set of code developed around India’s unique identity project Aadhaar, helps developers build products and services riding on the country’s digital infrastructure. Don’t be overwhelmed by the list. You’re going to love reading through it. Freelancing is the talk of the town these days, so if a blockchain platform for effective freelancing can be launched, it’d be great! How can this be done? Also, since blockchain is a super new technology and is presently at its infancy. Everyone is so excited to use it. It would automatically create more jobs as an engineer, an educator, as a futurist, and more. In the present day, the healthcare industry of India doesn’t have a robust infrastructure which records a large amount of data quickly and securely. Hence, a lot of time is consumed to obtain basic patient’s data. This is where blockchain comes in handy. Blockchain ledger stores information securely. This data can’t be changed by any foreign entity. Further, this ledger can be interconnected with other healthcare centers over the world so that time isn’t wasted in recording the same data over and over again, without compromising on security. Blockchain will not only make the banking infrastructure accurate and secure but also will help the government in accelerating financial inclusion. As per a study jointly released by EY and ASSOCHAM, 19 percent of India’s population is still unbanked. If blockchain is used, digital identities can be created for a number of citizens that lie at the bottom of the pyramid and are shunned from accessing banking and financial services. This will empower them to operate bank accounts, transfer money, apply for loans, and more, thereby taking financial inclusion to a whole new level. In February 2017, State Bank of India (SBI), the largest bank in the nation, introduced the ‘BankChain’-a community of 27 banks. The aim is to explore and build blockchain solutions for banking. SBI has launched beta versions of smart contracts and KYC platform. Applications which support and facilitate P2P and business communications have to be secured and the transactions have to be recorded in an immutable chronological fashion. There are several developers working around this use-case. For example, WhatsApp has launched a money transfer feature. WhatsApp payments feature based on UPI will let users send and receive money directly via WhatsApp messenger. Blockchain has presented to us a pragmatic way for casting votes. It’d be helpful in keeping the voter’s information and identity a secret and also, the problem of ‘vote counting’, any chances of fraud/foul play will be eliminated. The results are 100% reliable when voting is done on a blockchain. Thereby ensuring no hiccups in the victory of democracy. To innovate online advertising, Basic Attention Token (BAT) has been created which does away with middlemen like Google or Facebook and allows users to trade space with companies. Users using this service are rewarded with BAT. This architecture is more consensual and incentivizes users. Fake degrees are a matter of pressing concern in our country, India. So rampant is the problem that companies hiring freshers have to spend a crazy sum of money to verify the candidates and transcripts of the applicants. A digital certificate based on blockchain can eliminate this problem. The education degrees will be issues on a blockchain ledger, hence no scope of fraud remains. The trials are going to be done with Indian Institute of Technology, Bombay and colleges under the Delhi University. It’s a legacy to perform KYC process for every individual and then upload the gathered information and documents on a central database. This database stores data with a unique identification number for each customer. This reference number is used by organizations to access data. If blockchain is used here, there won’t be any duplication of efforts. The blockchain database would be encrypted and information can be accessed in real-time. It would become easy to identify individuals engaging in criminal activities. A cryptocurrency is a form of digital currency which is architected to be used as a medium of exchange. The examples of cryptocurrencies include Bitcoin, Litecoin, Ripple, Ethereum and Dogecoin. If Letters of Credit are put on a blockchain, tasks which generally take 7–10 days now take less than 4 hours! Every task at every endpoint can get automated through the means of a smart contract. The application enables exporters, importers, and their respective banks to share information on a privately distributed ledger. The application uses the open source Hyperledger as blockchain fabric, supported by IBM Research and IBM Global Business Services. Cryptocurrency, Ripple is currently being used to bring about a change in cross-border payment business. Soon, there won’t be the need for any Visa, PayPal etc. Distributed ledgers present an opportunity to help banks partially overcome such vulnerabilities in the future. If Supply Chain is put on the blockchain, there would be greater visibility and efficiency across the supply chain. This would result in higher value to customers and trading relationship. At any point in time, we can know who owns the asset and what condition it’s in. Supply chain management can be extended to the domain of agriculture as well. You could track shipments the entire way, making sure that, say, the temperature remains constant, with both the seller and buyer informed instantly and simultaneously of any issues. 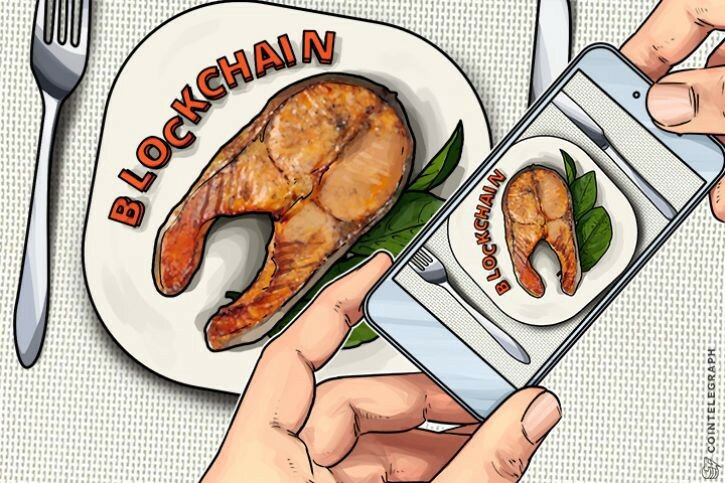 With blockchain, the food supply chain gets simplified as the data management across a complex network that includes farmers, brokers, distributors, processors, retailers, regulators, and consumers gets simplified and transparent. With the help of blockchain traceability of each product can be enhanced manifold. Retailers and farmers may scan blockchain barcode and get to know the authenticity of the product. This can be done on fertilizers, pesticides etc. Also, the distribution of subsidies can be more transparent if the budget for the same is put on the ledger. Everyone would know who is actually getting how much money. How can blockchain help helpless farmers? Before jumping into ?How can blockchain help helpless farmers? ?, let?s dive into what?s the need to fuse blockchain in agriculture. Blockchain can be used to make land records more efficient and accessible. Land registration can be done on the ledger which would ensure no fake registration, and also the entire chronological ownership history of the land can be traced. Smart contracting between corporate farming firms and farmers can result in easier contracting for the leasing of land. About one lakh land records with the CRDA (Capital Regional Development Authority) now have blockchain protection. The modern battlefield is all about the battle for knowledge. To check the authenticity of imported arms, you can employ blockchain by tagging the products. The entire history of the weapon can be known right from the time of its production. Automated bookkeeping and budgeting can be done on blockchain by using smart contracts. Blockchain can be used to verify the integrity of information received without trusting the sending party. R&D is still going on in this field. Blockchain can be used to track a variety of data like the carbon footprint of each product, the greenhouse gas or waste emissions of a factory. This can be used to determine the amount of carbon tax to be levied on that product. More is the carbon footprint higher should be the cost. Also, traditional power grids are centralized, which can create inefficiencies in energy distribution. And in parts of the world where people live without access to electricity, a P2P grid can be set up where asset like energy can be transmitted. For every supply that is there, the nodes in the supply chain need to be known and the GST is calculated suitably. Therefore, every supply can be logged on to the ledger and relevant information to be added. This will be viewable to all parties who are part of the GST Network. Here, there would be negligible human interaction. This guarantees us that the system is incorruptible and it would ensure timely payments and frictionless business. The idea is to use a blockchain-like distributed ledger that allows online access only to the people owning the ID, and any third parties granted their permission. Digital Birth Certificates: Imagine a secure, self-sovereign identity for the citizens of India wishing to access their birth certificate. Digital Passports: If passports go digital, one of the implications would be that it’d eliminate manual checks at the airport. It’d be cherry on the cake if the system combines biometric verification and blockchain technology. The system can further verify individuals through a three-dimensional scan via a Digitised passport is a self-sovereign identity for privacy protection, which allows passengers to control which parties can view their passport information. Warranty Receipts: If warranty receipts are stored on the blockchain, it will help reduce dispute between retailers and customers for lost receipts an unreadable receipt. It will also help in keeping a track of the history of ownership. Blockchain-based tracking of oil (asset) through the digital supply chain. It will show an immutable view of all events through the lifecycle of the asset. Smart contracts will make the business friction-free, and there would be much greater transparency in the network. The world, as we know it, is up for major overhauls and blockchain tech is going to play a pivotal role in the same.